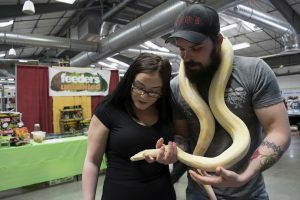 AURORA — Repticon toured Aurora on March 10-11 at the Arapahoe County Fairgrounds, bringing along all types of critters most folks would probably shy away from, like snakes, frogs, caimans and more snakes. Educators and top breeders from across the country showcased hundreds of reptile species and other exotic pets. There were small mammals such as hamsters, guinea pigs and Australian sugar gliders, as well as other species like praying mantises, tarantulas and scorpions. All critters were not only available for public view but to hold, pet, purchase and take home. Repticon is an event that tours the nation throughout the year. Founded in 2003 by Billy Healy, the mission is to “share reptiles with the world.” Repticon came to Denver for the first time in April 2012. Waddell said spectators can learn about reptiles and decide if they’re the right choice as a pet. She gave the example of how leopard geckos are considered low-maintenance which may make them a good start as a reptilian pet. Steve Cook of the Colorado Herpetological Society was there to instruct people how to care for their animals. The nonprofit organization was founded in 1972 to provide education in the fields of herpetology and herpetoculture and promote conservation efforts of reptiles and amphibians. In the zoology field, herpetology is the study of amphibians. Herpetoculture is the collection of live reptiles and amphibians cared for in captivity as a hobby or for breeding purposes. 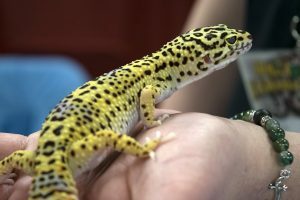 Vendor Missi Everard said that recessive genes in the leopard geckos make them easy and fun to breed. The low maintenance adult geckos feed only once or three times a week. 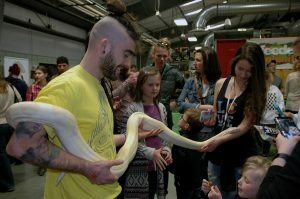 Kenny Sheafer attended the show with his own snake, a Kahl albino Columbian boa constrictor. Sheafer grew up around reptiles his entire life since he was born in Florida. He became familiar with Repticon’s beginnings when he moved to Colorado about three years ago. Sheafer said his snake’s previous owner wasn’t taking care of the reptile. It was covered in mites from head-to-tail and had a pretty big wound that festered down its side, eaten away by mites. Sheafer had him quarantined for about two months and treated him every three days to pick mites off of him. At about eight feet long and six years old, Sheafer calls him a gentle giant. Sheafer would like to see more education at the shows. After his own experience, he said lack of education is what leads to improper care for these animals. People buy them as novelty pets, but a few months later, they want to get rid of them. Whether you’re a reptile enthusiast looking to trade or purchase pets and supplies or just want to take the family out for an enlightening weekend event, Repticon is filled with excitement for all ages. got it and your photos published. Good job! You made it interesting by including folks own stories about their pets and interests. Great article, educational and informative.